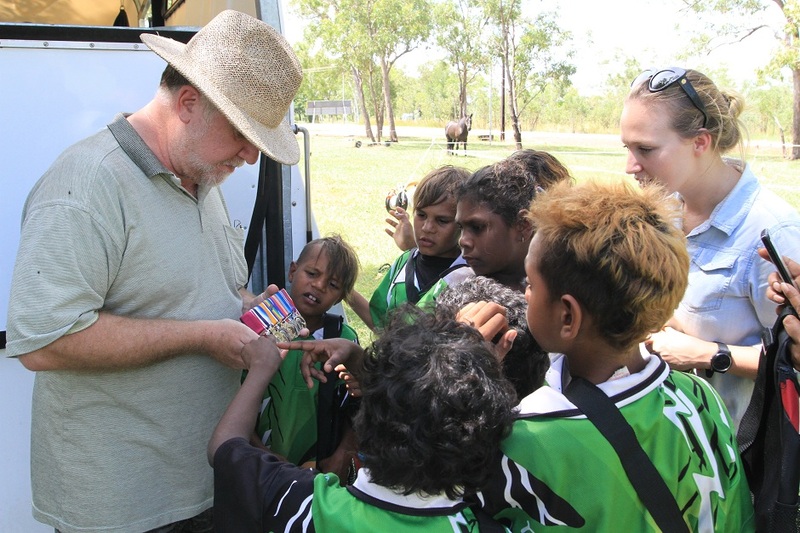 Dr Tom Lewis shows students from Manyallaluk School the replica medal of Albert Borella VC MM. Photo by Luke Paterson. 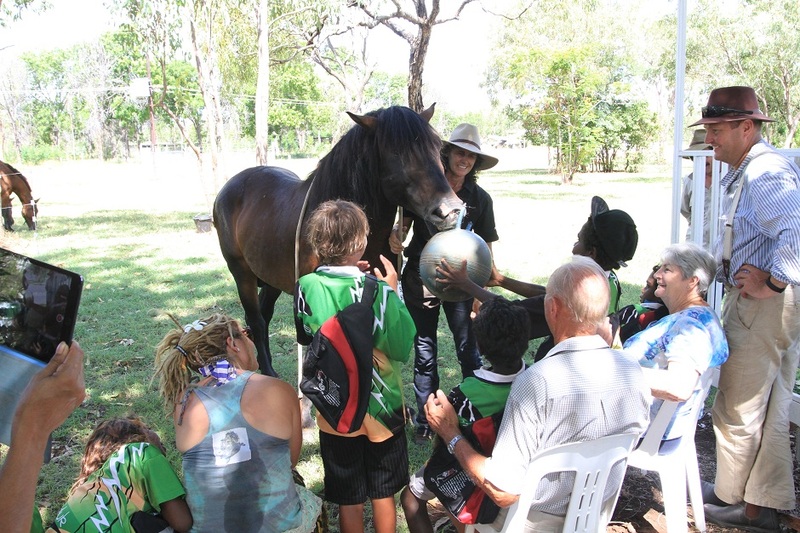 Students from Manyallaluk School visit The Borella Ride in Larrimah. Photo by Luke Paterson. 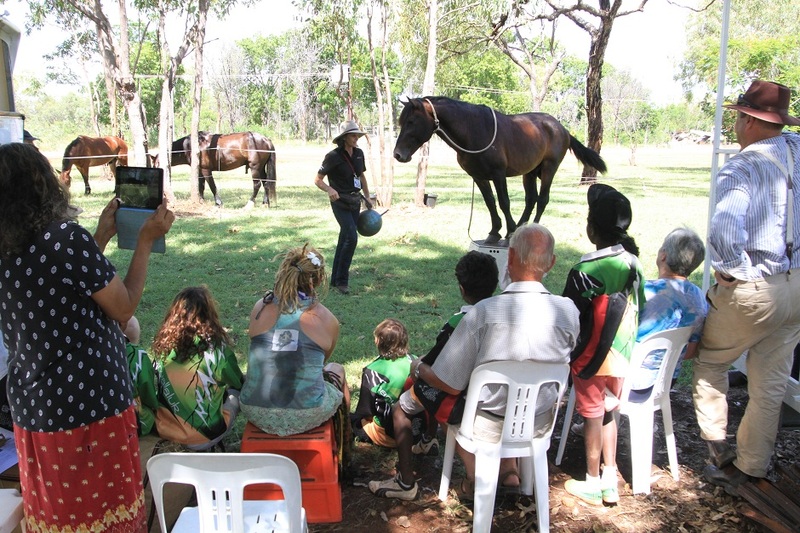 Janette Wilson and her horse Noble Comrade perform for students of Manyallaluk School. Photo by Luke Paterson. Noble Comrade plays ball with students from Manyallaluk School. Photo by Luke Paterson. 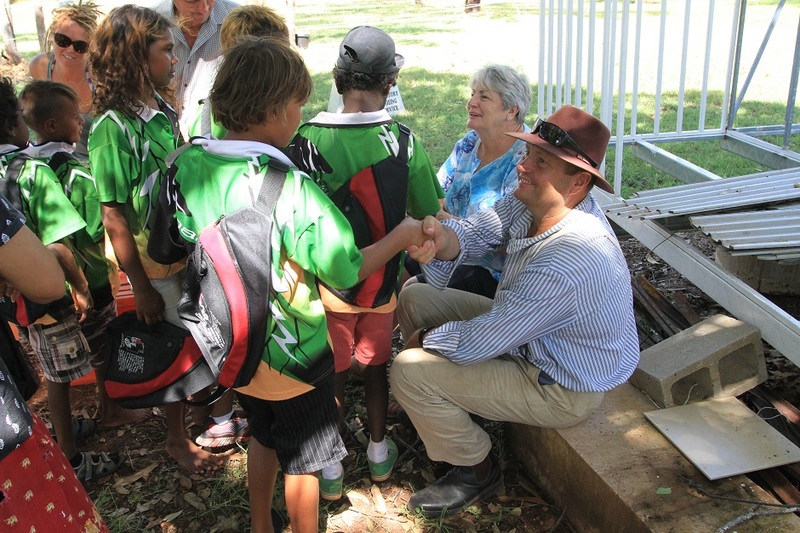 Students from Manyallaluk School meet the Borella family. Photo by Luke Paterson. 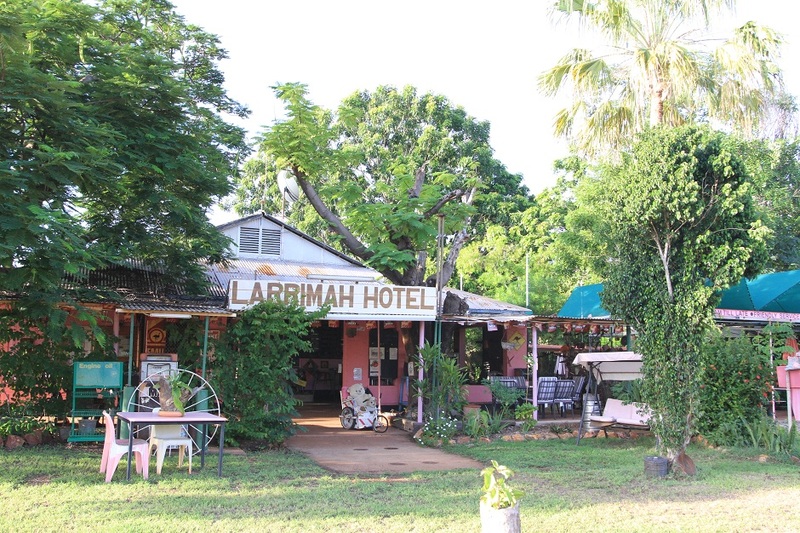 Larrimah Hotel. Photo by Luke Paterson. Arriving in Larrimah The Borella Ride was met with a small group of students from Manyallaluk School who had travelled a long way to see the team. Lead Historian Dr Tom Lewis brought out some items to show the students, including Albert Borella’s replica medals and some military costumes for the children to try on. He told the remarkable story of Albert Borella, while the students could see and touch the items from Borella’s life 100 years ago. Janette Wilson and her horse Noble Comrade then thrilled the students by performing a number tricks just for them. Most keen to speak with the children were the Borella family; Richard, Rowan and Mary. 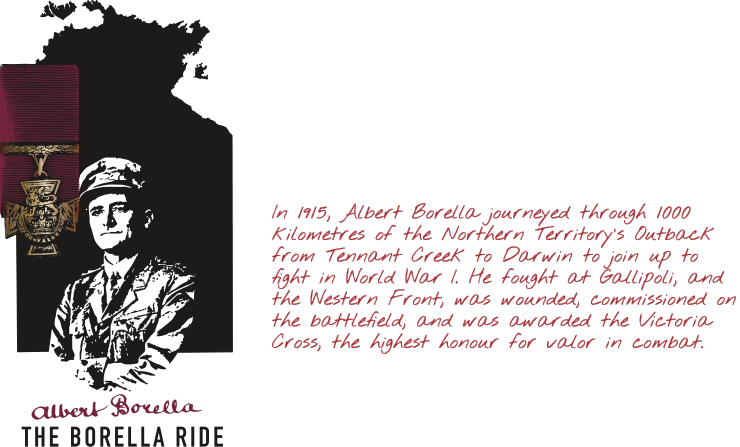 Rowan is the sole surviving son of Albert Borella, and for him and wife Mary The Borella Ride offered them the opportunity to learn more about his father’s experience in the Outback and share his story with people from across the Territory. 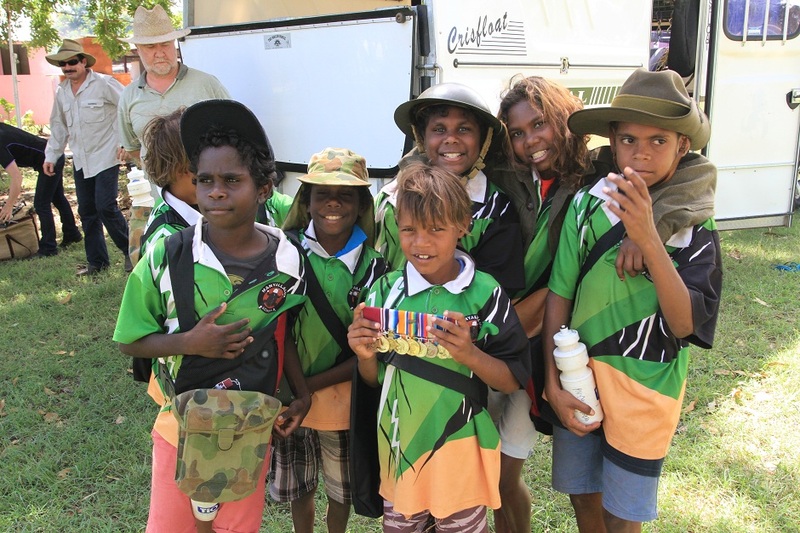 Rowan and Mary had important roles on The Borella Ride, including presenting the framed medal boards to representatives from the different communities and also handing out the Borella backpacks to children they met along the way, including the students from Manyallaluk School. The team were really appreciative that the students came such a long way to see them and that the children could share in the experience of the Territory’s flagship Anzac Centenary activity.